In addition to publishing numerous poetry anthologies and the New York Times bestselling novel THE AMERICAN HEIRESS, Daisy Goodwin has presented award-winning television series on poetry and on the enduring appeal of romantic fiction. She currently lives in London with her husband, two daughters and three dogs. So when she says she’s been researching her latest book, THE FORTUNE HUNTER, her “whole life,” she isn’t kidding! In this interview with Bookreporter.com’s Bronwyn Miller, Goodwin talks about the picture of Empress Elizabeth of Austria that inspired her to tell this story and the challenges of crafting fiction that has roots in real history. She also shares how her experience working in television production has been invaluable to her writing, why she feels so strongly about her charity, Women Taking Action, and why a 2am text message from a reader was one of the highlights of her career. Bookreporter.com: Your interest in Empress Elizabeth of Austria (Sisi) began when you were quite young. What was it about the young monarch that fascinated you enough to base your latest book on her? You have mentioned that the life of Sisi has “ghostly parallels” to that of Diana, Princess of Wales. What do you think they had in common? 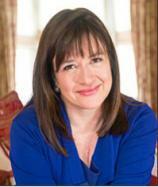 Daisy Goodwin: I first saw a picture of Sisi when I was about seven. I was in the hospital, and my father gave me a jigsaw puzzle of the famous picture where she is wearing a spangled ball dress and has diamond stars in her hair. About five years ago, I saw the picture again and started to read about her extraordinary life. Like Diana, she married young to a man she had very little in common with. Like Diana, she became famous for her beauty. Like Diana, she died tragically, and, like Diana, she had a weakness for cavalry captains! BRC: This novel is of a 19th-century love triangle, largely told from Sisi’s and Charlotte’s perspectives. 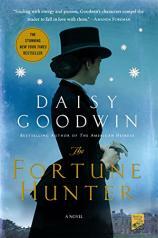 Why did you decide on the title The Fortune Hunter, the moniker used to describe Bay Middleton? DG: The title came quite late on, but I thought it summed up Bay’s dilemma rather neatly. Is he a fortune hunter or not? That is for the reader to decide. BRC: The rich details of the homes, clothes and customs are meticulous. How much research did you undertake for the book? DG: Oh, I have been researching this book my whole life. There are times when I feel as if I am living in the 19th century. I have read so much about the era and have visited so many houses that I find it quite easy to put myself there. BRC: Princess Diana’s ancestors, the Spencers, figure prominently in the story, and even Bay Middleton is a distant relation of the Duchess of Cambridge, Kate Middleton. Do you feel a greater responsibility when writing about real people? DG: Of course, but as there is no one alive who knew any of my characters, I feel I am on quite safe ground. It was wonderful when I gave a talk at Althorp (where Diana grew up) and Bay Middleton’s great granddaughter showed me the ring that Sisi gave Bay. It was a thick gold band that had BAY written on it in diamonds. BRC: When you’re creating (or recreating) characters, do you find that certain characters prove easier or more challenging to write for? DG: Bay is the first time I have tried to write from the point of view of a man --- I enjoyed it enormously. It took me a while to get Sisi’s voice, but once I wrote the scene with the raw veal, I felt I had got her. My favourite character in the book is definitely Charlotte; she is a woman after my own heart. BRC: Was writing this novel a different experience from writing your earlier books? DG: It took me a while to get going with this book; there are lots of characters to get my head around, and I had to research the hunting scenes, but once I got into the saddle, so to speak, it was a straight gallop to the finish. BRC: Even though THE FORTUNE HUNTER deals with serious subjects such as love, marriage and betrayal, humor finds its way in. How did you know when to insert humor into the story, usually at Casper’s, Chicken’s or Augusta’s expense? DG: All my favourite books have wit as well as great stories, and I hope that this book will make people smile in places. I had great fun writing for Augusta in particular --- she is a monster! I think Miss Bingley from PRIDE AND PREJUDICE was at the back of my mind. BRC: What would you like readers to take away from THE FORTUNE HUNTER? DG: I hope they will love the story and it will inspire them to read more about Sisi. My best moment was getting a text from a 14-year-old friend of my daughter at 2am that said: Fortune Hunter is awesome. Sisi is wicked. BRC: You started out your career in TV production. Did you always harbor the desire to be a novelist as well? DG: Oh yes, I always wanted to write, but never thought I could. I didn’t start until I was in my 40s, but I was surprised at how easily it came. I wish I had started earlier, but I think that working in TV has given me a sense of how stories work, and I think it helps that I think visually when I am writing. I can’t write a scene unless I can visualize the clothes and the colour of the walls. BRC: In addition to TV production and writing novels, you edit poetry anthologies. What part does poetry play in your life? Can you tell us about the “Poetry Doctor” feature on your website? DG: I am a great believer in the power of poetry. In Coleridge’s phrase "the right words in the right order" at the right time can make all the difference. One of the biggest decisions in my life was made after reading a Cavafy poem --- it gave me the courage to leave my job and start my own business. The idea behind the Poetry Doctor is to help people find poems for whatever their need is: heartbreak, bereavement, jealousy, even weight loss. I think many more people would love poetry if only they knew where to look. BRC: Your first book was SILVER RIVER, a memoir about your early years with your family. What prompted you to share your story? How did growing up between two households, two countries and cultures affect you? DG: I think I would have made a very good spy! I became adept at changing to suit the conditions I was in. My father’s house had lots of rules and my mother’s was very bohemian, so I had to learn to navigate both. But although it wasn’t the easiest childhood, it taught me to notice things, so I suppose it was good training for a writer. BRC: Can you tell us about your charity, Women Taking Action? DG: This is a wonderful scheme that gives families that are struggling one-on-one support for six months. The family partners go into situations where the parents are struggling to care for their children, and help them to become better parents. The vast majority of people want to do the best for their children, and this scheme is designed to help at-risk families BEFORE it’s too late. Early intervention makes all the difference. DG: Next month I am publishing a new anthology of poems about dealing with illness called 100 POEMS TO SEE YOU THROUGH, and I am working on my new novel, which is set at the court of Queen Victoria. I think my picture of the Queen will surprise a lot of people!